Choosing to make a small change happen is scarier for some people, but over time these small changes grow into a huge transformation. 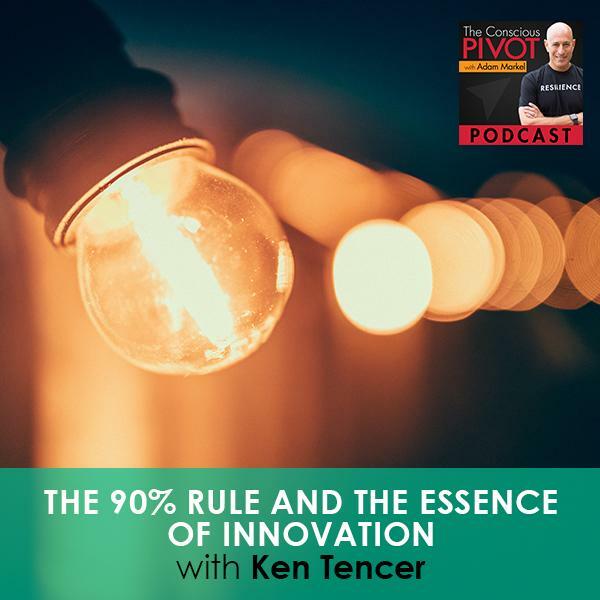 Author of the 90% Rule Ken Tencer grew up in a family of entrepreneurs and knows that sitting down and figuring things out is 90% of the growth of in a company or life. What about the other 10%? Ken shares his insights on how this small percentage of change can mean a lot with passion and time. I’m thrilled to be here. I feel so blessed to be alive, to be breathing. Not because I’ve had any near deaths experience, but taking a moment to be present with the fact that as I’m taking this breath and I’m consciously aware of it, there are people taking their last breath in this moment. Therefore, this is a sacred moment. I can’t feel any better than I do right now to acknowledge the fact that my body is here and is fulfilling its mission. It’s got me doing what I love. It has me connected to other spirits and other people. I feel so blessed that my marriage is so positive, that I love my wife so much, and that our kids are healthy. If you can close your eyes just for a moment and be in gratitude, whether it’s for the people in your life that you love, whether it’s for your body and how your body is fulfilling its mission, whether it’s perfect or not, whether you feel it is or it’s not, that you’re here and you’re breathing. That’s something right and something we can be grateful for that we get to share this experience together. Allow yourself to feel that gratitude for whatever it is that you want to be consciously appreciating. Talk about pivoting out of the places in our lives that we routinely complain or routinely look at things in a negative way or see the negative in things, is to be able to pivot in a breath to appreciation and gratitude. It feels good and good enough to smile and open our eyes to what’s in front of us. I’m opening my eyes to an amazing human being in front of me. I have a podcast guest with me. We’re newly introduced through a mutual friend and we’ve become acquainted. He’s an amazing gentleman that you’re going to get to meet and learn from. I put it to him that we talk about our setbacks, that we get in and get vulnerable even about the areas in our lives where we’ve made mistakes or things have happened, whether they were things where there were changes that we invited or changes that showed up. We didn’t remember inviting them or ordering them, but they ended up there to begin with or they ended up there in the end. Ken, let us know what you’re excited about, what you’re passionate about, and even maybe some of the things that you’ve been up to during your professional career. Whenever people ask me what I’m about business-wise, I generally say I’m an entrepreneur. I’ve been an entrepreneur for 25 years. I grew up knowing I wanted it to be one. I came from an entrepreneurial family. I’m one of those kids that was geeky in high school. In university, I was reading all those books about how people started businesses. I’ve always been fascinated by building things or finding ways to do things better. It can be in business. It can be in my life. I ended up writing a couple of books on innovation all around The 90% Rule. It’s pretty basic. It’s not a formula. It’s a philosophy that basically says, “Sit down and figure out all the things, as a company, where you believe you are good or great at.” Call that the 90%, then take a step back and say, “There’s always something that you can do better or differently to move your business forward.” That’s the next 10%. As an entrepreneur, every day I wake up, I ask myself, “What thing can I do better today? What can I do differently?” It’s amazing because while I started writing about business or for business people, after my first book, I started getting so many emails from people saying that they started using this for their life. The 90% Rule: What’s Your Next Big Opportunity? The first book was The 90% Rule. The second one is Cause a Disturbance. It builds on the first. People started writing and they said, “I know it’s a business book, but the whole notion of the 90% rule, figuring out what’s important to me in life, where I am in life, and figuring out what it is that might be missing and looking for that next 10%.” I was amazed at first. You write something, and you don’t really realize how other people might read it or what they might read into it. It made me realize that that’s something I’ve always done in my own life to figure out what was making me happy in the present moment, whether it was at work or at home. Look for that next step. I’ve always liked the notion of 10% because it’s achievable. Even if you take small steps, you might end up with quantum shifts in your life or your business. If you set out to climb a mountain all in one step, you can get afraid. You can turn back. You can say, “It’s too much for me.” The notion of 10% was, “I can do that. I can take a small step forward, I can try something different. I can learn something new.” I’ve been applying that to my life and to my business, one of the faster growing company that was manufacturing natural bath and body quick care. I was in my late twenties. As much as natural holistic is well known at present, it was quite new in the market at that point. The more successful we got, I found myself being very stressed and not liking or appreciating the successes that we’re coming into my life. I like to play guitar, like to write, I like to think and analyze things. When I stood back, I realized that creative part of me was gone. You talk about gratitude. That’s what I am grateful for, that I had the strength and courage to pivot. It’s a wonderful ride. It’s a wonderful business. I’m meeting some incredible people around the world and working with great entrepreneurs and great large companies internationally. Every day is really cool and exciting. I was fortunate enough that I have three wonderful kids that have grown up. There’s a couple still in university, travelling, studying in different places. I’m fortunate to be able to join them and have the time to join them and the means to. It’s a life balance I don’t think I ever would have had. In my twenties, I couldn’t have understood it. Now we’ve got a good-sized consultancy firm that applies that to businesses in North America and in Europe. 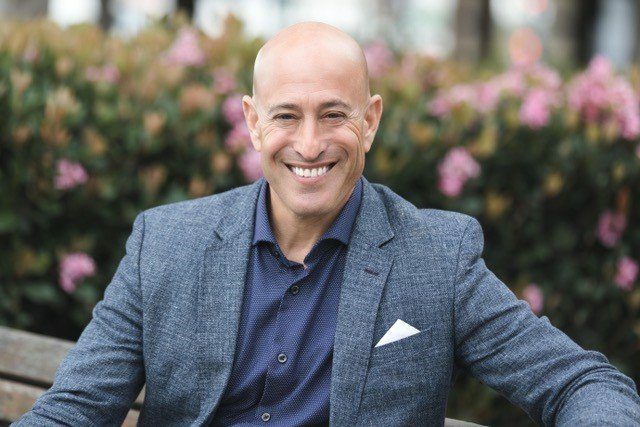 My passion has gone from entrepreneurship to intrapreneurship, helping people in larger companies understand how to take that next step forward, how to make a change in their business or in how they do things. Pivot is a book about making small changes. They look small in the moment and that’s why a lot of people resist doing them because they think this isn’t going to make a big enough difference. They’d prefer to make a quantum step which we know, more often than not, 90% or more of people don’t take a quantum step because it’s frightening. It’s scary and it ought to be because those steps can oftentimes lead somebody to cause a great disturbance and not necessarily in a positive way or at least a disturbance of a size they’re not prepared for. With that option of burning the ships or jumping ship in front of them, most people choose to do nothing. They’re stuck in fear. It’s only those outside the bell curve that have that level of bravery. I won’t call it courage because it’s not courage. When we do something small or large that scares us, that is act of bravery. That’s an act of courage, stepping forward in spite of the fear. To do something that risks family, risks your job, risk, everything, and to succeed, those are the people outside the bell curve. The people that ended up bankrupt or whatever things befall them in that moment, that just becomes a way to make the argument that it’s better to bank on the devil you know than the devil you don’t. It’s just a small change, but making small changes, incremental changes, those changes over time produce the potential for transformation. Making small, incremental changes, those changes over time produce the potential for transformation. 25 years in, I’m not sure if it’s courage or crazy, but I’m still at it. I remember working with a large company. I don’t even know if the word is courage. People are so comfortable in what they’re doing. There’s a great cartoon that I read. It was a boss yelling at somebody, “Get back into your cubicle and think outside the box.”It shows you work is so compartmentalized in our lives and how we think and how we live. Because of the stress and the amount that we have to accomplish in a day, to some degree, we have to compartmentalize. Somebody walks into our room and says, “Step outside that compartment. Step outside the box.” I don’t know if it’s courage or if we don’t remember how to do that. When I started working with companies, a large company was innovation program. The first thing we did was look at how they communicated. We looked at how they use email and they thought, “This isn’t innovation.”I said, “Bear with me for a while.” All of a sudden, they started saying, “I spend this much time a day reading emails that I don’t have to because we’re copying too many people all the time.”I said, “Let’s make that small change. Let’s figure out who needs to be communicated to and when.”That worked and all of a sudden, they go, “Look at how much time I have. What could I be communicating? What could I be doing?” I stepped back and I said, “Let’s find that gain half an hour and start making notes about things you’d like to change in your business and in your function and the area around you.”They were okay with that. Over a series of six to twelve months, they formed working groups. They got that courage to take those ideas and choose one to act on, a small one at first. All of a sudden, the team grows together. They’re great at stepping outside of the cubicle. You see this transformation in who they are and who the business is. It’s comfort to me more than courage. It’s giving people permission again. We have to learn to just be free again to think and do and act. What is the essence of innovation? I’m assuming that the 90% Rule and Cause a Disturbance are both books about intrapreneurship and innovation? 90% Rule: We have to learn to just be free again to think and do and act. The first two are about entrepreneurship and innovation. The third one that I’m working on is called Never Be Satisfied. That is going to be on intrapreneurship. It’s pretty simple. For me, it’s about having an idea and acting on it. A lot of people try to make innovation to this big complex notion, but all it is really doing something. When you think of ideation or having an idea, that’s not innovation. It’s doing something in your business that helps to generate revenue or control costs and, and as I like to say, “Ultimately engage your customers or delight them in a more purposeful way.”That comes from acting on your ideas. One of our big problems in life is that we’re really good at hiding our ideas. We write them on the back of a napkin, on a sticky note. We put them on the side of our desk. We get refocused on front burner issues. They get dirty and dusty. We look at them and go, “That was a good idea, but now it’s not relevant.” That to me a loss for ourselves because we haven’t achieved something. It’s a loss for our business. I encourage people to write these ideas in a more public area, to put up a large board for everybody to see, to make notes on as to where we are in the process. That’s how you become innovative. You have the idea, you put it up, and you work together to bring it to market. Don’t leave it on the side of your desk. Don’t leave it in your computer because when you close your computer, the idea goes away. I speak to people, mostly entrepreneurs, by that any small business owners and occasionally people that are involved in larger organizations. There’s this distance between ideation and execution there’s ideation and, and there’s execution. What I’m hearing is that part of that landscape in between might be what we call innovation or the process. You said it’s not a formula, but it’s that process of innovation. What can you say about that? Does that spark anything in you the way I’ve set that up? That process of innovation, that’s accurate. As companies, we get so excited about our ideas that we think they’re going to walk themselves to market and they don’t. Innovation is a business discipline. It’s like accounting. It’s like operations. It’s like HR. You don’t write down numbers on the back of your paper and hope they get filed monthly or quarterly. If you come up with an idea, you need to assign it to somebody. You need to create that path to market the plan. The wonderful thing is that you have this built in advisory team. The people who’ve helped you generate the idea want to know how you’re doing with it. If you get off track or if you want to share things with them, they’re there for you. You build a team, you have an advisory committee around you, and just create those steps to market. Create those check points to market because the thing about innovation is even if it’s small, you are doing something new, you are doing something different. There’s a few more unknowns than filing your taxes. Come up with a plan, come up with a process that will help close the chasm between having an idea and getting it to market. Innovation is simply having that idea and bringing it to market. It’s simply having that idea and bringing it to market. There are three main areas. There’s product innovation, which is coming up with a new product. There’s process innovation. For me, there is business model innovation as well. Of those three, the most important one for somebody starting out is process innovation. It’s how you deliver the light to a customer. I remember being in Washington and somebody gave me the name of Red Top Cab. It was early days for smartphones and all of a sudden, I got an email from the cab company saying, “Your cab number is 100 and its two miles away. It will be there in five minutes.” I’m thinking, “How cool is that? It’s answering all those questions that I have. Where’s my cab? When’s it going to be here? How do I know which one is mine?” That process innovation using technology to answer a customer’s concerns, that to me is extremely powerful. It creates tremendous delight for your customer and it’s probably the most accessible. For that cab company, it didn’t cost them a lot to send a text. If you think about the other side of it, I’m not phoning them every two minutes saying, “Where’s my cab?” They are saving money and they are increasing my delight. Innovation is have the idea, bring it to market, start with process, move with product, and over time you’ll get the business model innovation, which is how you can do things differently. I wouldn’t do that on day one. You said there are three types of innovation, business model innovation, process innovation, and product innovation. There is a lot of types of innovation. Innovation applies to how you communicate it. It goes to your distribution, your supply chain. If you want a bucket in three simple ways, product, service, process and business model on top, those are your core. I’m glad you put together the core. When we talk about innovation, we look at it broadly. When we’re talking about pivoting, this is the science of baby steps or some small changes. It is the status quo that is the greatest challenge to business, whether it’s small business or large business. My entrepreneurship program, the positioning or slogan is “resist the status quo.” That’s the first thing that we have to learn as individuals or as entrepreneurs or people in business. The status quo “same old, same old” means you’re going backwards, especially in business. I read this incredible article and it said that75% of customers who leave our company for a competitor are actually satisfied with us. That’s scary that you can be satisfying somebody and they’re going to walk out the door and go to your competitor. With technology, they don’t even have to tell you that they’re leaving. I see satisfaction equaling status quo, equaling opening the door to losing business. You’ve got to resist the status quo, completely buying into baby steps and the small changes. From there, they won’t be so small. With me, you start with process, you start with changing email flow and how you communicate, frees up time to think about product, frees up time to think about the services you want to surround your products. All of a sudden, you have a new business model. I haven’t scared anybody and said, “You’ve got 30 minutes to come up with a new business model.” It’s not happening. You didn’t direct anybody back to their cubicle to think outside the box. This is disruptive thinking. You cause a disturbance. You cause a disruption. The math on this is to see what happens when you make small change over time. Those two lines, the status quo line and the line of change or transformation, they diverge greatly. That disruption or that disturbance, that thinking in a creative way or outside of the box, is a process of making changes all the time. It’s evaluating. It’s not like you innovate in one area. You’re not going to just innovate in one spot. It changes your course for sure, but then you have to continue to apply that same innovation process, that way of looking at things ongoing-ly. It will be that jagged up and down, things will work, and things won’t work, but the overall trajectory when you’re committed to innovation is up and to the right, which is signaling that this positive growth is happening. 90% Rule: Break them down into small chunks, and make sure you deal with one thing at a time. If that’s too much, break out one thing into smaller chunks. In the books I talk about compound interest. I talk about our investments and the stock portfolio. The reality is you get 5% to 7% net on your stocks every five years or so. You double your money with compound interest. Who wouldn’t like to double their business every five years? You’re doing it in increments of 5% to 7%. If you have breakthrough years, it’ll be faster. As you get to the disruptive part of innovation, it can be faster in the steeper curve. The basic understanding is you can look at stock portfolio, you can look at small ball and baseball, a lot of singles can win games and people don’t hit home runs every game. Start somewhere and keep going. You grow, plateau, grow, plateau. I really appreciate that you stopped in for the podcast. When it comes to being innovative, obviously we’ll have challenges. That’s a part of the process. How do you handle those challenges? How do you continue to be resilient? You have a business consulting firm, you’ve written books. Not everything has always gone well. You’ve had challenges. What’s something that you do, whether it’s a ritual or a practice, something that you’ve developed to help you to be resilient in the face of what happens when you’re an innovator and when you live? My late father was an entrepreneur for many years. When I started out in my twenties, I built and sold a good size manufacturing firm. On those bad days, he said, “Break them down into small chunks, and make sure you deal with one thing at a time. If that’s too much, break out one thing into smaller chunks.”It’s so easy to get overwhelmed. It’s so easy to take a situation as a hundred things and try to solve them at once. Resilience means understanding how to make everything more manageable so that it doesn’t overwhelm you. That was one of the most important lessons he ever taught me. I’m not sure I do it perfectly, but I do try and look for the essence of an issue and what I have to do first. If it means it’s a really tough one and I got to look at fifteen minute increments in my day, I do that. That’s the baby step formula. Thank you so much for spending time with us. What a blessing. What’s the name of your company? We started off with some gratitude and appreciation for the moment. As we depart, I will leave you with the same recommendation that you wake up tomorrow. It is such a blessing to have a new day, to have a new assignment, to work diligently on something you’re passionate about, including yourself. My magic wand has been waived and that means we all get to wake up a little bit more tomorrow than we are today. Wake up our consciousness. Wake ourselves up in meaningful ways, that you’re grateful for that in that moment tomorrow when you wake up. If you’re inclined to do this is, I recommend it, there’s no harm. There’s only good that can come from it. You put your feet on the floor, you throw your arms up in the air, and put your hand on your heart and declare out loud, “I love my life.” With that, have a beautiful rest of your day. Many blessings and thank you.